Very similar to The Baskets of Sunshine, this project is donated to area families in transition. Individuals who are transitioning from homelessness to stable housing. 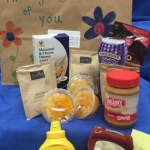 A handled bag is decorated with words of encouragement and then filled with staple necessary items to get a pantry off to a good beginning. Things like ketchup and mustard, peanut butter and jelly are included in this project. This provides great lessons about the hard work that many homeless individuals do to get back on their feet.